This tab gives easy access for setting a number of main view title-related attributes of notes. The results are applied to all selected note(s). Alignment. Map icon tile alignment options; sets $NameAlignment. 14 (100) - default (set via Doc Settings - see above). Bold. 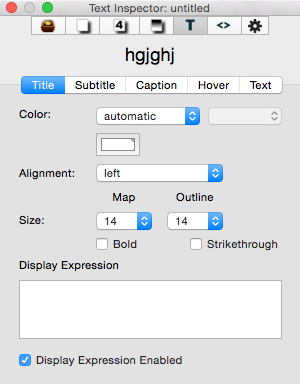 This option bolds the title ($NameBold). Strikethrough. This option set strike-through on the title toggles ($NameStrike). Display Expression Enabled. Toggles $DisplayExpressionEnabled.